Anyone familiar with Maria Mazziotti’s poetry or anyone who has flipped through the pages of Patterson Literary Review, the journal she edits, knows that her work has long stressed the narrative form, in particular the idea of specificity. 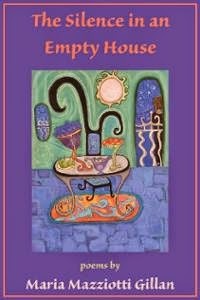 Her latest collection of poems, The Silence in an Empty House, continues in the confessional and narrative modes, in particular the death of her husband, Dennis. While the collection focuses heavily on the personal, it also addresses larger issues, including Vietnam, the BP oil spill, and even local news, including a bear hunt in New Jersey, while still circling back to the issues of love, marriage, and the death of a spouse. The collection is divided into three sections, “All About Love,” “What We Carry,” and “The Loneliness That Lives,” and by the end of the collection, there is a sense of a completion and healing. The first section primarily deals with the beginning of the relationship. The opening poem, “When We Were Engaged,” for instance, employs the metaphor of a rollercoaster to address nerves and anxiety that come with young love and engagement. Centered in Coney Island, the poem recounts the couple embarking on a roller coaster ride and the nervous feelings that follow. “By the time the coaster stops and you hold my hand/to help me off, I’m giggling in that nervous way/that tells me everyone you’re glad you’re alive and that/five minutes ago you weren’t so sure you’d survive.” The poem is important in the context of the rest of the collection because it highlights the ups and downs of the relationship, especially the challenges and heartache caused by illness that the later poems address. Furthermore, the poem establishes the colloquial language used throughout rest of the book. What Gillan does especially well is link external factories to memories of her husband. For instance, in the poem “My First Tornadoes,” the image of the wind “hissing like a snake” transports the reader to Kansas, where she and her husband lived early in their marriage. The handling of time is done especially well, particularly the blending of present and past. they set the room on fire. Gillan too links political/social issues with the personal, thus avoiding poetry that is mere political diatribe, but rather something much deeper. In “Watching the Pelican Die,” she addresses the BP oil spill and connects that disaster, particularly images of a pelican soaked black, to images of her husband’s body decaying and succumbing to illness and ultimately death. The poem opens, “On TV I watch the pelican with tis mouth wide open/its wings and body coated with oil,” before transitioning in the second stanza to images of her husband, whose hands “turned black, whose tips of fingers have been “eaten away.” There is acknowledgement by the poem’s conclusion that death is inevitable, and all we can do is be brave in the face of it. As heart-wrenching as some of the poems may be, especially since the relationship is so fleshed out and developed, there is a sense by the book’s final section that no matter how heavy the grief, we learn how to stand on our own again. The books concludes with “When the Christmas Cactus Blooms,” and like a lot of the poems, one particular image, in this case a Christmas cactus in bloom, is linked to images of Dennis. However, the poem’s closing lines emphasize the idea that we have to let go in order to survive. to let go of your hand. The Silence in an Empty House is a deeply personal collection of poems, particularly the poems specifically addressed to Dennis, the poems that employ the “you” pronoun. The book is a journey through young love, illness, death, and learning how to survive as a widow. Beyond that, it addresses the larger world, while showing how that world always intersects with the personal. Many of the poems can be considered a collage, a blending of memory with photographs, newspaper headlines, or objects. The Silence is an Empty House is a fine addition to Gillan’s prolific career and its final poems prove that she still has faith in poetry, in the narrative form, in her story, and the stories of others. Brian Fanelli’s poetry has been twice nominated for the Pushcart Prize and the Working Class Studies Association’s Tillie Olsen Creative Writing Award. His work has been published by The Los Angeles Times, World Literature Today, Boston Literary Magazine, Blue Collar Review, and other publications. He is the author of the chapbook Front Man (Big Table Publishing) and the full-length collection All That Remains (Unbound Content). He has an M.F.A. from Wilkes University and teaches English full-time at Lackawanna College, while completing his Ph.D. at SUNY Binghamton.